Follow these simple tips for projector care to extend the life of your projector and projector lamp. Your projector represents a major investment so want to keep it happy and working for you. 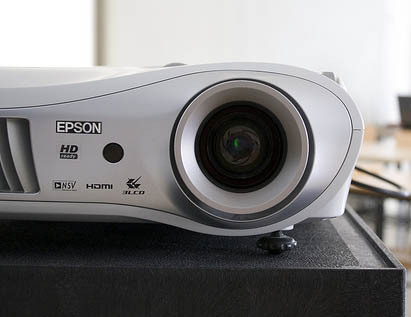 The following projector care tips are easy to follow and will extend the life of your projector lamp as well as your projector. Let it cool. Don’t shut down your projector too fast but let the fans run for at least two minutes. These machines operate under high temperatures and the fans are designed cool down any super hot elements. Shutting down too quickly your projector’s components. Chill out. Packing up your projector while it’s still hot may cause lamp filaments and other wires to break. Let the lamp cool down before packing up. Keep it clean. Your projector’s filters allow airflow throughout the projector and prevent overheating. Clogged air filters means decreased ventilation, which means increased temperatures, which means a possible lamp meltdown or explosion. Dust and dirt also affect the image quality. Check your air filters every few weeks and keep them clear. Keep it flowing. If your projector has a permanent mounting, make sure the mounting plates don’t block the fan vent and there is enough airflow around the projector to keep it from overheating. Watch the on/off switch. Don’t be trigger-happy. Turning your projector constantly on and off creates a power surge that will make your projector wear out faster. If you do leave your projector running, make sure that it gets a two-hour rest every 24 hours. Hands off. Never, ever touch a hot lamp. You can end up with one nasty burn. Never touch a cool lamp bulb either since the oil from your skin leaves a residue on the lamp. Once the lamp heats up the oil residue will burn, creating a black spot on the lamp that shows up on the screen. A large enough oil spot can cause the lamp to shatter. Watch the lamp life. Be sure the lamp timer has been properly set so the projector will accurately track the lamp life and give you a status update in time for you to replace the projector lamp. You don’t want to be caught off guard with a projector suddenly shutting down because the lamp has run out of time. Buy genuine OEM lamps. Don’t be cheap. We all like to save money but generic, “compatible” lamps should be avoided because of their inferior materials and workmanship. The few bucks you save can end up costing you much more in the long run when these counterfeit lamps damage your projector and compromise your health. Read 7 tips for spotting counterfeits to learn more. Go green. Try using the power saver or econo mode on your projector. The only time you’ll really need full brightness is when you are presenting outdoors. Indoor settings, particularly if the room is darker will be fine with the econo mode. You’ll reduce the heat used, lengthen the life of your lamp, reduce wear and tear on the projector and helping the environment. Read the manual. Ok—so it’s not the most exciting read but at least glance through the manual so you have a working knowledge of your projector. For quick, easy instructions on replacing your lamp projector, check out this website. I agree that keeping the air filters in the projector is an important thing to do. What I didn’t know is that it is better if you check the filters every couple of weeks to make sure they stay clean. I will make sure to start doing this, I want to keep my projector working properly and avoid any accidents. It all depends on where your projector is being used. The dustier the environment, the more frequently your filters will need to be cleaned. I would start of with once a month and see if that is enough. Thanks for commenting. Please my BENQ LED projector would not power up. A red button with inscription LAMP comes up Blinking and no image projected. The lamp don’t come up at all. What should I do. Your lamp has reached it’s end of life and the projector is protecting itself by not turning on. You need to replace the lamp immediately. I recommend buying from http://www.discount-merchant.com/ for a reasonably priced but also OEM genuine lamp. We have lots of guides for BenQ on this website so be sure to search for your model for a step-by-step guide for lamp replacement. Let me know if you don’t see your manual here and I will get something posted for you.